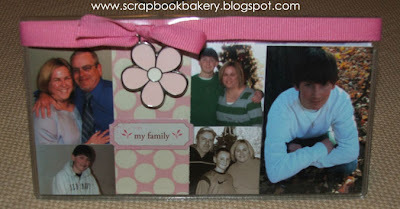 Scrapbook Bakery Blog: Venting....but a giveaway at the end! Mmmm...I'll say "Beaches". Totally a girly movie! Sorry about the rude comments from the other ladies. People either have word vomit or just have to constantly criticize others to make themselves feel better. Heather, i feel your pain. i stopped going to group crops due to rude people.but the best way to stop it is to say " my that was rude", they usually turn red and shut up. hope you got some pages done anyway. if you lived by me you could come to my house, we scrap in jammies and gripe about rude pta moms at our school. and my favorite movie is steal magnolias. Hmmmmph! Some people are just dumb! Try not to let it bug ya too much :) My guess for the movie....Sleepless in Seattle? WOw -they were rude and so waht if your pages are involved - that is what makes them wonderful - all of your special touches- oh well. I'm thinking "Sense & Sensibility"
Oh and i Love the pink, the checkbook cover idea and porcelain charm - LOVE LOVE those esp. the flower! girly movie? thats a classic? Wow, some people are so rude as a way of life that they don't realize they're rude. Especially if they hang out with equally rude people! Sometimes all you need is a good vent! My guesses for a "classic" girly movie would have to be Sixteen Candles or Pretty in Pink! Oh i guess Grease - ya thats what my daughter and her friends used to watch so it just stuck in my head! Just let the rudeness roll off your back and dont even worry about it!! OMG! What RUDE MEAN people! Who are they to downplay what makes YOU happy? Who are they to try to critize you? You know what they say "People in glass houses should not throw stones". Sorry to hear they spoiled the weekend. But you are a better person than they are. Found your site through Jennifer McGuire's and all I can say is Wow! What rude people! We have all encountered them, but it is never nice. Love your checkbook cover! My guess would be Grease but I don't know if that is considered a classic or not, so I'll go with Breakfast at Tiffany's. o I'm loving that checkbook cover!! I'm glad you got to use all the pink you wanted;) I know the nerve of some people. As for the movie I want to say Titanic! some people just aren't worth our time or worries. and i find that most of the time ... they're just jealous! lol! sorry you had to deal with it though on your weekend. and i'm guessing "when harry met sally"! I'm going to guess..Pretty Woman. Sorry those rude women had to spoil your good time. Some people just have no class... good for you for keeping it together.. you are the better person!